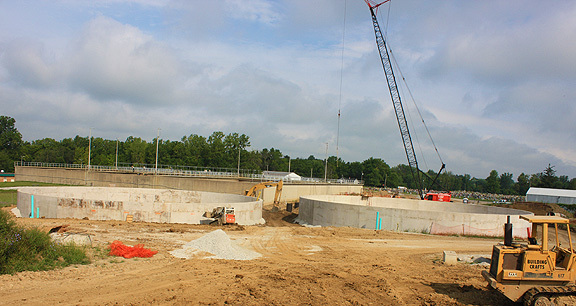 Project obstacles and solutions: The City of Elwood was faced with a dilemma surrounding updates to its wastewater treatment infrastructure. Their wastewater treatment facility had been built in the 1940s. Like many other systems of its day, it combined storm and sanitary sewers. The antiquated system would often dump raw sewage into Duck Creek. The city was faced with an Agreed Order from the Indiana Department of Environmental Management (IDEM) that called for $35 million in sewage infrastructure improvements to their old plant. This would have caused a steep increase in residential utility rates. The city sought a less expensive solution that would meet the demands of IDEM and lower the overall costs of the project. It was decided that building a new wastewater treatment plant would be far less expensive than fixing the old one. Bids were taken and Building Crafts was selected as the design and build contractor to construct the new treatment facility at a cost of $8 million. Key to the building of the new facility were the clarifying tanks. These concrete tanks were needed to handle millions of gallons of water. IMI QC/QA worked with Building Crafts to design a mix that would waterproof the walls of the tanks. This included a crystalline admixture that makes the walls impermeable. IMI supplied 4,000 yards of concrete for the construction of the tanks. This step of the construction process was completed in the fall of 2015. For more information on using crystalline admixtures to waterproof concrete, contact your local IMI sales representative. Click here.